Make Easy Instant Pot Hamburgers for a quick dinner in your electric pressure cooker using ground beef and a few other ingredients. This easy recipe is perfect when you can’t grill or fry hamburger patties, and even picky eaters approve! I’ve seen so many people talking about how to cook burgers in Instant Pot that I just had to try it. If you want hamburgers for dinner, but grilling isn’t an option, you, making burgers in your electric pressure cooker is the next best thing. 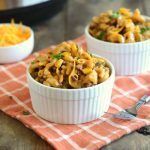 It’s an easy ground beef recipe that’s perfect for busy days! You guys, all I have to say about cooking burgers in the Instant Pot is don’t knock it until you’ve tried it. I know, I know that nothing quite compares to a thick, juicy burger cooked to perfection on the grill, but hear me out on this one — k? So, why on earth would anyone want to make hamburger patties in the Instant Pot? Well, maybe you don’t have a grill, or maybe it’s too hot or too cold for grilling. And if you’ve ever fried burgers on the stove, you know the clean-up isn’t fun! Trust me — been there, done that! If you’ve got a pressure cooker, you can still make tasty hamburgers or cheeseburgers in just a few minutes. They’re quick, easy and delicious. And the clean-up is easy, too! When you cook hamburger patties in the pressure cooker, you’re basically steaming them. It’s like making hobo dinners in foil packs when you go camping. So, you season your ground meat, and then you form the meat into patties. I usually like to keep the seasonings on burgers pretty simple and let people go crazy on the toppings. I used my basic hamburger recipe here, but you can use your own if you have one you love. Then, place each hamburger patty on a square piece of aluminum foil, and fold the foil to make an envelope. Add a cup of water to your Instant pot, along with a trivet, and stack the packets on top of each other. 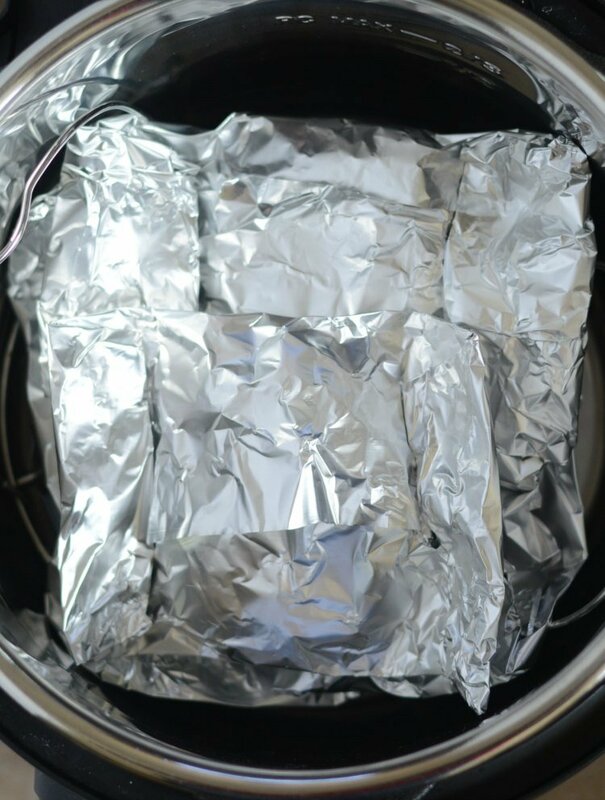 If you don’t want to use aluminum foil, you can use parchment paper, instead. I tried it both ways, and the results were the same! We like our burgers on the thick side, so I cooked them for 15 minutes and let the pressure release for 5 minutes after that. You could also do 20 minutes with a quick release, or if your burgers are thinner, you could probably do 12 minutes. You might have to experiment to get the perfect cook time, but as long as the burgers are 160 degrees internally, you’re good! The first time I made Instant Pot hamburgers, we ate them right out of the pot, so to speak. But, the next time, I added a little BBQ sauce on top, broiled them for about 5 minutes, added some cheese slices, and they were even better! Make Easy Instant Pot Hamburgers for a quick dinner in your electric pressure cooker using ground beef and a few other ingredients in foil packs. This easy recipe is perfect when you can't grill or fry hamburger patties, and even picky eaters approve! Hit cancel, and when pin drops, open cover, and remove foil packs. Recipe was made in 6-quart Instant Pot pressure cooker. I hope you enjoy these easy Instant Pot hamburgers as much as we do! You really can make just about anything in an IP!! What a quick and easy way to get dinner on the table! I’m starting to think so, and yes, it’s super quick this way! I love learning new ways to use my Instant Pot. Thanks for sharing these, they look AMAZING! Oh I love easy recipes like these! It’s super easy — perfect for busy days! Such a great way to make burgers! They look great! Thanks, Cathy. 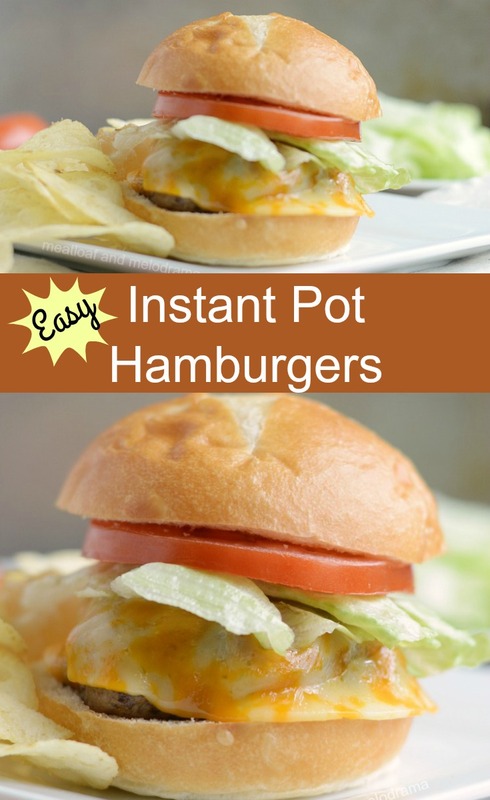 It’s amazing that you can make burgers in the Instant pot! Great idea, nothing beats a good burger! 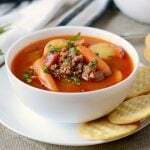 Love my instant pot so I will definitely be trying this! YES! Just when I thought nothing will surprise me anymore about the IP, I learn I can make hamburgers in it! Wow! Awesome! Okay, I’m sold. We’ve been looking at grills for our new house but now I’m thinking we can make it through summer with just the instant pot. These are genius! 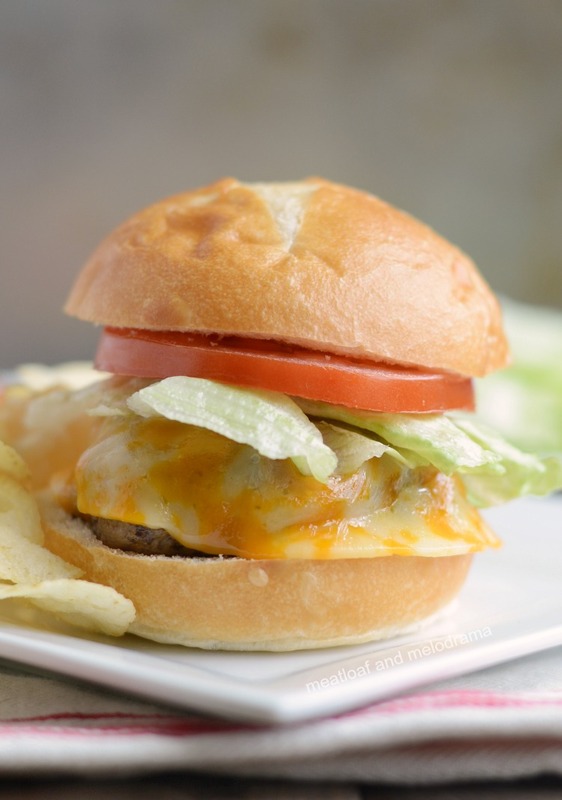 What a great idea to make these burgers in the Instant Pot. Thanks so much for sharing with us at Full Plate Thursday for the party this week. Hope you have a great week and come back to see us real soon! Thank you for sharing this! I’m looking forward to trying it. Do the burgers need to be broiled if NOT using barbecue sauce? 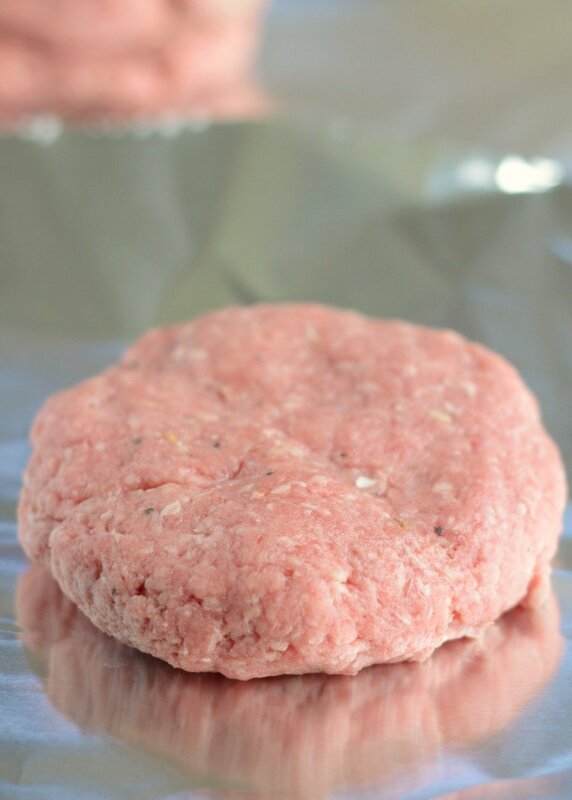 Can you use frozen patties and if so how long would you cook them? I haven’t tried using frozen, so I’m not sure on the time, but I’m sure it’s possible. I’m telling you I am loving my instant pot more and more!! This will be a perfect option on those crazy busy nights. This is exactly how I feel, Dorothy! Have you tried this with turkey burgers? 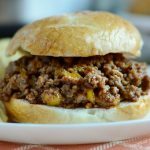 How would I adjust the cook time for turkey instead of ground beef? I haven’t made these with turkey, but I believe the cook time should stay the same.